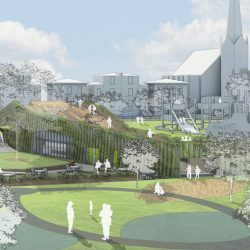 A planning application has been submitted to the London Borough of Lambeth for a new community hub in Stockwell that will accommodate multiple charities, community needs and social functions in a single facility, while also safeguarding the site as a children’s play space for future generations. This is a project we are particularly proud of. We designed the new Hub and delivered the project to planning pro-bono. 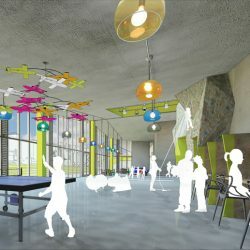 Conceived as a highly flexible community space, the hub contains the core activities of the Adventure Playground and the One O’clock Club. In addition, these facilities can be combined to create a multi-function space available for an inclusive range of community, cultural and social functions. 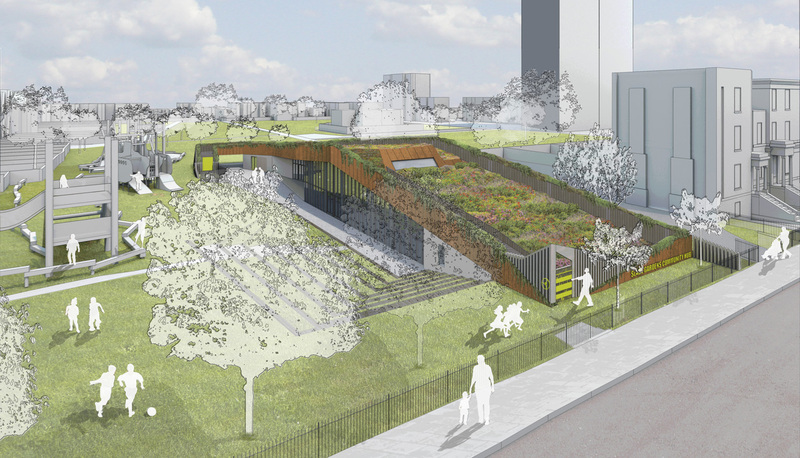 A café is will serve and enliven the wider park and help generate revenue. The design was born out of a desire to create a playful building that would flow out of the landscape, blending in seamlessly with its park context and respecting the conservation area into which it overlaps. This ramping form emerges from the ground, reducing the height and visual impact but also providing a playscape for children. Sustainable and inventive, the scheme uses exposed concrete construction, timber, green walls and an accessible biodiverse roof, resulting in a low carbon development which emerges from the landscape. 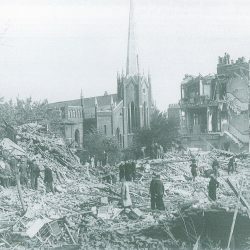 The site, which was hit by a bomb in 1944, killing 11 people and destroying nine houses, is now known as Slade Gardens. It is a small but important park sitting at the junction of three electoral wards, representing diverse communities and an important historic conservation area. It has become a valued public amenity for a wide variety of user groups and the adventure playground in particular is a much-loved asset at the heart of the community. Like many adventure playgrounds in London, the local authority can no longer fund the operation and its future is uncertain, along with the One O’clock club it also manages. 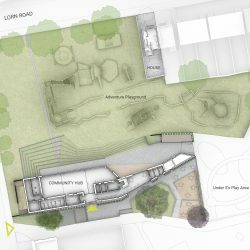 The community, via the Slade Gardens Community Play Association has run the playground for the last 18 years and was invited by Lambeth to create a hub to maximise the value of the asset with a view to gaining an asset transfer (of the land) to become independently operated. To ensure viability and enable the project to be self-funding, the application includes the development of a single house containing two maisonettes in the style of one of the houses lost in 1944. All proceeds of the sale of these units would be vested in the short term and long term delivery of the project, making this scheme more simple and viable for Lambeth to support.